If you had asked me even two years ago what I was doing for my birthday, you never would have heard me say I was going to a comic book convention. In fact, had someone suggested it, I most likely would have snorted and said, "and why would I want to do that?" You see, I was in the closet about part of my geek nature. Everyone knew I was into music and if you caught me unsuspecting, I'd even answer some sci-fi question without thinking. Now, fast forward to my birthday 2011. Want to guess where I spent it? Yep, at the Detroit FanFare Comic Book Convention. Ok, technically, it was the day after my birthday but since it fell during my birthday weekend, I'm counting it. FanFare was held at Cobo Hall in Detroit. I had never actually been there before, but it wasn't too hard to find. Parking was a bit trickier, but we even managed to sort that out fairly quickly. By we, I ought to tell you, I didn't go alone. I actually tagged along with my friends Chris and Lauren. Chris ranks among what I call the uber-geeks of comic books. He has...*gasp*...subscriptions. Me? I merely have issues. They wanted to go and they were nice enough to let me tag along. I am so glad they did. I had a great time and I met some really cool people. As usual, I want to tell you about the good, the bad and the summary. Ready? Location: Cobo is a great place to hold an event like this. It's spacious enough that you're not tripping over everyone and yet you don't feel like you're lost in a cavernous space, never to be heard from again. I have heard that next year they may move to a different location and I'm looking forward to seeing how this large event translates to another venue. Blood Drive: One of the things that this event offers is the chance to help save lives. In exchange for giving blood, you get the chance to rifle through tons of boxes of old comics and pick out 50 to take home and enjoy. Chris and Lauren both gave blood. I couldn't because of a recent tattoo, but because I tried, they still let me take home some comics. I think it's a fantastic way to combine a large event with something that could save lives. Since I have a son who needed a blood transfusion, I'm looking forward to next year and a new chance to help out, free comics or not. As someone who rarely knows who did what on anything..just ask my former dj friends, it was fun for me to walk around and to actually meet some of the people behind the books. Some of them were amazingly nice and friendly. In fact, I could have spent all afternoon hanging out with a few of them. These are the people that stick out in my mind. These are the people whose books I have started looking for. It was a fantastic experience. The Tardis & the comic books for the blood drive in the background. The Talent: I know that I wrote about this up above, but I am sad to say that not all of the talent was super nice and fantastic. There were a few that were downright rude and I found that very disappointing. The reality is that in this industry, the fans and the artists/writers/publishers need each other. Without one, the other doesn't exist. It really doesn't pay to alienate or make a fan feel bad about themselves. I know more than one sale that didn't happen that day because of situations like this. My bad section is rather on the short side and that's because all in all, I found this to be a wonderful event. There were tons of vendors there for people to pick up just about any item their heart desired. There was some seriously amazing talent there that you could spend a few minutes talking to and most likely, picking up some autographs. The publishers ranged from a brand new two man start up to companies that have been around for ages and that we're all familiar with .Bottom line? If you're into comic books, geekery and fun, this is a convention that you'll want to check out next year. I can guarantee I will be. 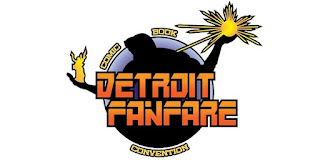 For more information, be sure to check out the Official Detroit FanFare Website or check them out on Facebook.